The following is the introduction provided by Revell of Germany on the instruction booklet. Since it was introduced in 2000, the Allschutz-Transportfarzeug (ATF – All protected transport Vehicle) Dingo has developed into a real all rounder in the German Army; even for missions for which the Dingo was not originally intended. The changes in the World wide military situation since 1990 showed that for many new missions the available transport vehicles such as the LKW 2t Unimog 2 tonne truck offered no protection for the crew and that the TPz Fuch and SPzMarder were to large and heavy. In addition, increasing importance was given to protection against mines and explosives. After 147 of the Dingo 1 had been built on the Unimog chassis U-1550-L, it was followed by the Dingo 2 on the U-5000 chassis, which gave it a higher load capacity and incorporated other improvements. Almost 600 of the Dingo 2’s were purchased by the German Army in several variants. Taking into account international users such as Belgium, Luxemburg, Austria, the Czech Republic and Norway, Krass-Maffei Wegmann have already supplied over 1,000 of the Dingo 2 (2013 position). The ‘ATF Dingo 2 GE A2 PatSi’ variant has been in service in Afghanistan since 2006 as a patrol and security vehicle. The vehicle can accommodate 6 troops. By way of self protection, as a rule it is equipped with a 7.62mm MG3A1, which can also be operated from inside. It is driven by a 163kw (222hp) turbo diesel engine and has all wheel drive with differential lock, ABS that can be overridden and a tyre pressure control system. A GPS navigation system can be used. In addition the Dingo 2 has auxiliary heating, air conditioning and ABC protective ventilation as well as an external rear view camera and outboard public address system. The Dingo 2 has outstanding anti-mine protection for its class, which is accessed via the V shaped deflector under the safety cell. This cell in which the crew sits, is also protected against 7.62mm ammunition. The tyres will run on empty, which enables it to keep moving at reduced speed if the outer casing is damaged. The combat weight is 12.5 tonnes. With sales figures of 149 the ATF Dingo 2 GE A2 PatSi is the vehicle in greatest demand. This product from Revell of Germany is packaged in an end opening box, with a good artwork of the vehicle on the front in a desert setting; I have a pet hate about end opening boxes as you cannot keep sub-assemblies in the box. The sprues are packaged in a number of clear plastic bags taped closed. An initial look at the sprues and their contents is a mix of good and bad. The sprues are cleanly cast with no flash present; there are a lot of flow lines present in the mouldings, but no issues were observed with this imperfection. A number of sink marks were obvious amongst the moulded parts, most notably on the wing mirrors, antenna mounts, and the rear of the V shaped hull; the sink marks are a pain, but will be easy to correct as the areas I have identified are on flat surfaces with no detail to worry about. There are a very large number of ejector pin marks on the mouldings, but I believe having not built the model, that the only places that will be an issue are the interior roof and chassis rails. The chassis in this model is a multi-part affair; this has allowed Revell of Germany to include a lot of detail which is often overlooked, but this does mean that care will need to be taken to insure the chassis is completely square when complete. The axles and drive shafts have a fair level of detail, which along with all of the other details will result in a good level of detail overall in this area. Included with this model is an engine and gearbox, which is fairly simple in design but provides a starter for anyone wishing to further detail the model. First impressions of the wheels is that they are very simplistic, however further investigation shows that the hubs are in fact very realistic in their simplicity, the only detail missing from the hubs is the hole where the tyre valve sits. The first real bone of contention for some modellers is the tyres; the reason for this is because they are made of vinyl rubber and as we all know modellers either love or hate them. The tread detail is very well replicated, looking to me to be very accurate; what about the makers mark? Well there isn’t any and there are not any on the real thing. The interior of the vehicle is a high point of the model. Revell of Germany has done a nice job of including a very good interior, should you wish to make this an area of the model on show. The seats have good detail as does the framing of them, if you wish to improve them all they need is some bum creases worked into them. The dashboard is another nicely area, which I believe will more than satisfy most modellers; I particularly like the effort Revell of Germany has put into the adjustable steering rack and steering wheel. The radios, door linings and ancillaries finish this area off a treat making it an area of the model that should be considered a great reason to purchase the model. On the subject of the interior Revell of Germany has also included decals for the dash and screens. The open rear canvas covered compartment is also an area that has been well detailed inside, this means that the interior will look good either empty or filled with stores. My only concern here is that ejector pin marks will need some work and that the rear canvas cover will need to be scratched if you do decide to leave this area open. The super detailers amongst us will have a field day with the cab and rear interiors. The vehicle exterior looks to match images of the Dingo 2 that are online. The doors have been designed in such a way that they can be left open and so allowing a great view of the vehicles interior. The raised detail on the side panels of the vehicle is a good match for placement, but they seem visually to me to be a little on the small side. The snorkel and mirrors are a good match for reference pictures, the mirrors do have the issue of the sink marks mentioned earlier that will need to be filled, but flat surfaces are the easiest to fill and sand. I feel this is another part of the vehicle that has very good detail and rates highly with me. The wire taped to the front of the instruction booklet is for the antennas, Revell of Germany have supplied data on the length of the antenna which is something often overlooked. The 7.62mm MG3A1 weapons station on the roof, above the rear crew compartment, again looks as if Revell of Germany has done their homework. The parts overall look a good match, with the only weak part being the muzzle of the barrel as it is moulded with no recess. The weapons station has its own sprue and for reason unknown the plastic seems to be on the hard and brittle side, this may cause some issues when removing parts from it. The decal sheet is another good area of the model, the decals are very thin and have great colour. The decals provided for the interior of the vehicle will be well received and should further enhance this area. Another nice touch on the decal sheet is the registration plates; Revell of Germany has supplied blank plates with separate numbers, meaning the modeller can if they wish make a model of a vehicle they have personal reference for. 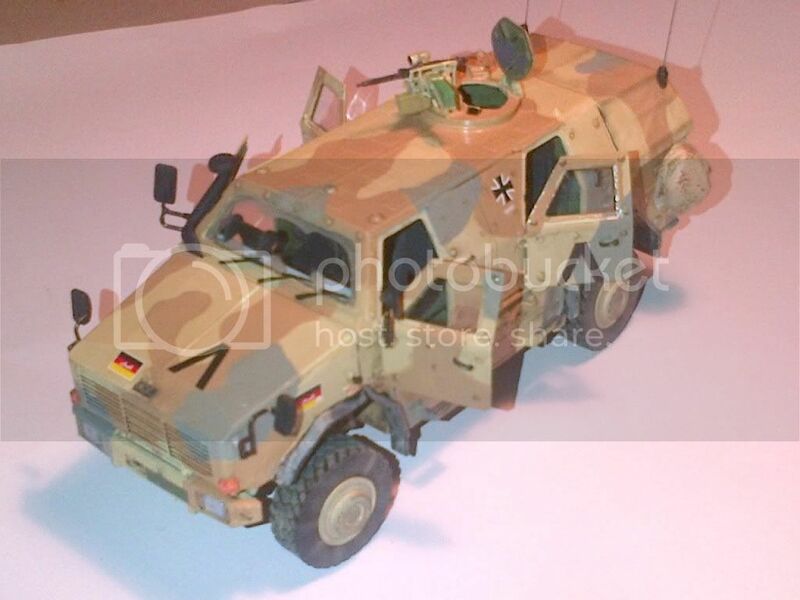 This latest release the ATF Dingo 2 GE A2 PatSi from Revell of Germany is a very impressive model, factor in price and it becomes an even more impressive release. Another plus for me are the finishing options which due to the wars in Iraq and Afghanistan most modern kits have all been offered in desert warfare colours, this kit offers more colourful options. There are some weaknesses with the MG, the ejector pin marks are a pain and the sink marks will need to be remedied; however I still highly recommend this model to you. Highs: A great level of accuracy on the inside and out of this model makes it a great release by Revell of Germany. Lows: The sink marks are disappointing, as are the large number of ejector pin marks; however none of these problems are beyond anyone with very basic modelling skills. Thank you for that Sean as I missed the wing mirrors. It is ok with me Olivier.